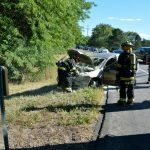 On September 12 the Carman Fire Department responded to a report multiple car accident East bound on I-890 with possible extrication and a report of the car on fire. First arriving units found the patient being treated by REMS and no fire. Upon conferring with state police, 131’s crew cooled the car and surrounding area to extinguish any source of possible ignition.